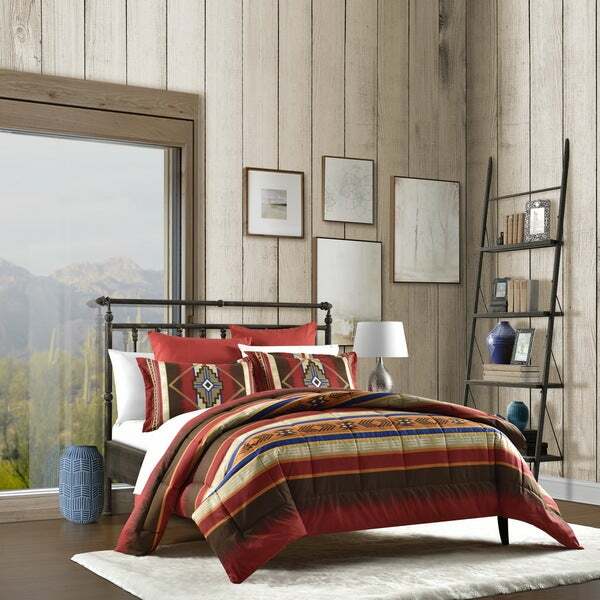 Make your bed the focal point of your bedroom with the eye-catching design of this Southwestern Comforter set. Including a comforter and shams, this bedding set gives you a complete and cohesive look that helps bring your vision of a rustic bedroom to life. Love the vivid colors and the extra length. A big surprise was that they included 2 red Euro shams in addition to the queen shams. The somewhat slick surface of the top of the comforter actually makes it easy to spot-clean with a damp cloth if one of my mastiffs drools on it. This one isn't thin...it's fluffy. LOVE it for the guest room! Great quality and beautiful colors for our new home in Arizona! I wasn't really excited about the Southwest décor my husband wanted to go with, but I had my choice in the first house in CA, so now he gets his choice. I am SOOO glad I didn't buck him. I LOVE the colors, the weight, the design. This is only one of three bed dressings I ordered from Overstock and am thrilled with ALL of them and have actually come to enjoy desert living - - it's style, it's laid-back feeling, the weather is GORGEOUS except for 3-4 months in the summer, and then we just go down to the lake or stay in the air conditioned house. Overstock, and it's beautiful offerings helped get me adjusted to being "a desert rat". I can't say enough good things about Overstock. I've been ordering from them for at least 12 years and I have NEVER been disappointed. Oh yeah, and this comforter is definitely more value than you pay for. The comforter set is nice, comfy and the colors are vibrate, good quality. I'm very happy with my comfort set. I do recommend this to a friend. Shipping is prompt. Looking forward to ordering another comforter set in a different style and color soon. I like the colors. It looks good on the bed. However, I could only give it 3 stars because the material on the top of the comforter is odd --it's almost like plastic or water-proof material. It actually crinkles when you move the comforter. (Pillows shams are the same.) The underside of the comforter is a solid color and very soft. Bought this for my sons room. He loved it. It’s beautiful and just like picture. Vibrant Southwest colors. Many colors you could put with it to accent the room with. Highly recommend this set! The comforter fits perfect on the bed and looks very attractive. The material top is somewhat different for a comforter but adds a zest to the colors. This comforter is really nice. It's pretty heavy and will be nice and warm in the winter time. The colors are very rich looking and add a nice southwest flair to my guest bedroom. I would definitely recommend this to anyone. The solid color underside is very soft. The colors are bright. The material on the top of the comforter and the shams is very strange. I think it must be waterproof. I almost feel like with time and use it might "crack" and peel. Time will tell. Feels like sleeping bag material? I don't know how it will launder though with this odd material. For the price though, I can't complain. Not happy with this purchase. This Comforter has a shiny plastic like coating on the outside that makes an annoying crinkle sound when touching it. Not pleased at all when I attempt to return the item and it states this item is not returnable. I would not of purchased it if I knew about the material stiffness and no return. This is my first product order from Overstock and my last. Unfortunate. Great colors, just a little stiff. Feel like I'm out west!! The comforter is just what I ordered. "What is the color on the reverse side?" "Is there a valance or curtains to match this comforter?"